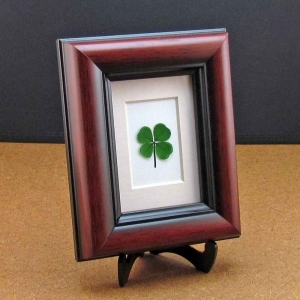 A real genuine preserved four-leaf clover mounted on a beveled Linen mat, under glass in a custom made Mahogany finished wood frame with Black Accent. 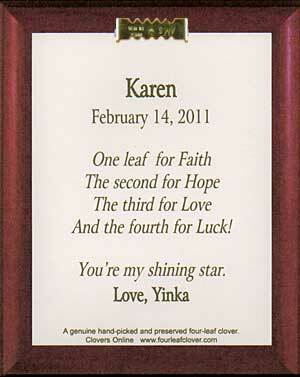 Back of frame has clover verse, plus your personalization. Includes an Acrylic Table-top Easel for display or can be Wall mounted. Frame is 4 1/8" X 5 1/8" and comes gift boxed with clover fact sheet. Standard Frame Layout Below - Layout can be customized. Having trouble coming up with a salutation? Here are some ideas: Enter your salutation in the text box above.